The KFC Malaysia story began with the opening of its first restaurant on Jalan Tunku Abdul Rahman in 1973. There are currently over 600 KFC restaurants nationwide serving Malaysians great tasting chicken 365 days a year. Whether its the heavenly taste of the Original Recipe or the simply amazing Hot & Spicy, there is such a great variety for you to enjoy at any KFC restaurant including mash potatoes, wedges, coleslaw, and more. Valid at all KFC Restaurants outlets in Malaysia. Not valid for online purchases and KFC Delivery. No refunds are applicable for purchases below RM10.00min a single receipts. Purchases exceeding RM10.00 are to be borne by the bearer. This voucher strictly not exchangeable for cash and revalidation. Purchases are subjected to 6% GST and 10% service charge where applicable. Expired vouchers will be not accepted. Our management reserves the right to amend any of the above terms and conditions without prior notice. Vouchers will contain a mix of expiry dates eg. 31 August 2017, 30 September 2017 and 31 October 2017. Each voucher is valued at RM10. 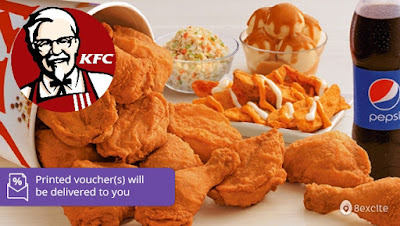 However, a RM20 KFC Voucher could also contain a mix of RM5 and RM20 vouchers and the 10 x RM10 KFC Voucher can also contain a mix of RM5 and RM20 vouchers. No maximum order and no expiry date (it will be mixed). Vouchers will be delivered 7 working days from the date of redemption. Free Shipping. Please fill up the FORM so the vouchers can be shipped to you. You will receive your KFC Voucher after 7 days you filled up the form.